Information about updated toys sections, and newly added toy sections for 2010. Rainbow Brite :: Toy Section Updated! New images added to the Rainbow Brite section! I�ve also re-organised it slightly so that dolls and sprites have their own pages now, whereas miniatures and poseables are now merged together. 14 new images added! All images have been updated to clearer, larger versions. Image of the previously unknown unproduced doll �Newborn Star� added. 25 new images added! All images have been updated to clearer, larger versions. Images of the four Taco Belle sprites now added and correctly titled as �Happy Talk Sprites�. Images of 2 of the 5 sprites produced by Emotions added. 7 new images added! All images have been updated to clearer, larger versions. 3 new images added (clearer, larger versions). Turtle Tots :: Toy Section Updated! Lots of new images and information added to the Turtle Tots page! I�ve divided what was a page with all the plush Turtle Tots on it into separate pages for each line. All six original Turtle Tots now known and pictured. Information about the French line added. Information on US and French line added. Little Beauties :: Toy Section Updated! New images have been added to the Little Beauties page! Image added of a third hair colour variant of �Violet�. Image added of a third hair colour variant of the white bodied pony. Four images added for each of the four larger playsets, including the micro ponies which came with each one (previously not mentioned). Loose image added for the �Musical Carrousel Beauty Parlour�. Unknown page renamed Other, and now includes prototypes. A large selection of images of prototypes ponies from the Original series and Growing Hair series have been added, thanks to Jana! My Magic Genies :: Toy Section Updated! New images added to My Magic Genies page! Two extra loose doll images added showing colour variations of Lani�s accessories. All promotional images updated for the four produced dolls and promo text added. Packaging images added for Suki and Zyra. Loose image added for Anya. Promotional group �image and text �added. Secret Keepins :: Toy Site Updated! New images have been added to the Secret Keepins page! Advertising�image of the three pups added. Advertising image of the two kitties and one bear also added (previously not known about). New images have been added to the Lil Lollypops (aka Sweetie Pops,�aka�Daisy Dolls) section! As all images are either new or updated I won�t add them in to this post. Larger packaging images added for each of the six dolls. Front and back packaging images added for each of the three lines of dolls. Larger side packaging images added for each of the three lines of dolls. Liddle Kiddles :: Toy Section Updated! New images and information has been added to the Liddle Kiddles page! What started off as a simple update to add in the eBay listings�turned�into a�mammoth�four hour event! I�ve updated all the images and included several new one too. I�ve also re-organised the images into clearer groups of those produced by Tyco and those produced by Uneeda. I�ve also found three images of Uneeda�s Liddle Toodles line too.�I�ve found a few new characters and their names whilst updating, which are listed below. Name of unknown doll added in � �Tracy Tea Party�. Image of fourth doll added in � �Betsy Bride�. Images of four Uneeda dolls added. Image of one Liddle Toodles doll added. Image of fourth doll added � �Rosie Rose�. Images of three more Uneeda dolls added. Images of three Uneeda dolls added. Image of one Uneeda doll added. Images of two new playsets added � �Fashion Purse Playset� and �Funpack�. My Little Angel :: Toy Section Updated! New images added to the My Little Angel page! Images added for �Cookie� and �Luminar�. Slightly better image of �Luv� added. Correct images added for �Faith� and �Hope�, plus images of incorrectly labelled packaging also added. Images of incorrectly labelled �Faith� and �Hope� packaging also added. Krystal Princess :: Toy Section Updated! New images have been added to the Krystal Princess page! Packaging images added where found (two of four frilly domes, all six glitter domes, two of four moulded domes and both deluxe domes). Name of�glittery�blue based doll now confirmed as �Seashells�. Packaging images added where found (three of four�unicorns�and two of four pegasi). Flip �n Fancy :: Toy Section Updated! New images and information has been added to the Flip �n Fancy page! Dolls re-ordered to show which ones were made using the same�moulds. Three new dolls with images added (�Rosey Renee�, �Sweetheart Sadie� and an a doll with unknown name). All twenty four of the adult dolls are now pictured. An image of the baby doll (or dolls if they were actually twins) has now been added. As indicated, I don�t yet know if this was an individual doll or sold as identical twins, neither do I don�t know its/their name. Image of the black version of �Bridal Belles� now added. Image of the �Fun Friends� now added and white version correctly re-named as �Fancy Friends�. Image of the �Dancin� Duo�s� accessories now added. Image of the �Travellin� Twosome�s� accessories now added. Two packaging images of the Bath & Bed playset now added. Kindles :: Toy Section Updated! New images have been added to the Kindels page! Images of the missing two Lap Sized Dolls now added (�Flashi� and �Sparki�). Kidgetts :: Toy Section Updated! New images have been added to the Kidgettspage! Images added of the �Chic Boutique� and its doll �Karen Smith� (both names also now confirmed). eBay Listings Added to Toy Section Pages! I�m slowly adding eBay listings into every toy section page (bare with me, there a lot to do! ), as�I thought it would be�interesting� for collectors to see some of the toys up for auction (to either buy or just to admire)! �It should also generate some income from my site without it costing you a penny (just click on the listings, no need to buy). I�ve tried to use search phrases which will�definitely�come up with correct listings for each toy, but the rarer toys will require a more �personal� touch which I�m unable to do with the tool they provide. In this case, when there are no toys found, a search box will appear. Unfortunately eBay Store sales aren�t included in the listings either, so just click on the �see all items� link and you�ll see all the other items too (plus international sales too if you�re lucky)! Grumples / Razzcals :: Toy Section Updated! New information has been added to the Razzcals page! It�s possible that the other four characters were the UK version �and had the same names, but a UK Grumples packaging image is needed to confirm this. Also still needed are �images of the other two (UK?) colour variations. Glo Pals :: Toy Section Updated! Two new images have been added to the Glo Pals page. They were added into a forum topic some time ago (thanks to Jana), but I forgot to add them in here! Nosy Bears :: Toy Section Updated! Some new information has been added to the Nosy Bears toy section! Baby bears line now confirmed to be called Shaker Nosy Bears and all nine bears names are now known too. Names of all three Nosy Bunnies are now known. One new�image added to the Accessory page. 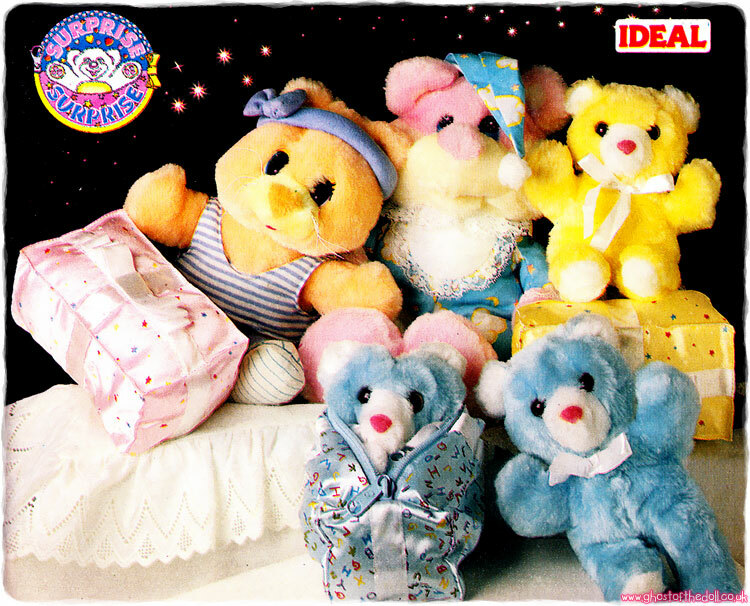 A page has been added for Unproduced Nosy Bears items (just for fun)! Jelly Bean :: Toy Section Updated! A few new images have been added to the Jelly Bean toy section! Two MOC images added of the miniatures (still to find Lucy Lemon). Image of the Crayon Doll miniatures which used the same mould (for comparison). Image of a new accessory added (Sew Mate). Several new images have been added to Darlin� Dinos! Image of one of the Double Snazzies MIB added. One new Sweet & Lovely image added (purple), and the pink one updated. One new Sweet Talkers image added (green). New Clapping Dino set added, one image found so far. Dino Tots name change to Dino Babies as packaging found, showing they were sold in pairs. Two new images added. Image of Lil� Dinos with Personality Cards added and new information. One new Plain Lil� Dinos image added (pose 2, orange). One new Ballerina Lil� Dinos image added (pose 4, orange). One new Multi-coloured Ballerina Lil� Dinos image added (pose 2, pink). Lil� Dino Babies line added in with two new images (green and blue) and one image re-organised correctly (purple). Smooshees :: Toy Section Updated! Fourth Halloween Smooshee now added (bat), and cat image updated. Hooks :: Toy Section Updated! New images added to Hooks toy section! Fourth large Hook now added (parrot). Three more medium sized Hooks added (bear, raccoon and skunk), making seven. One more L�il Hooks added (�squirrel), plus two colour variations (of mouse and bug). One new accessory added (the only one! ), a magic slate. A new toy section has been added for My Magic Genies! �Each Genie and Genie Pet has a magic fortune telling feature and comes with a beautiful bottle home. My Magic Genies were produced by Kenner in 1995. They were a series of small genie dolls and animals with plastic bottle houses. Each set came with several small eccessories and there were also two playsets. Magic Merbabies :: Toy Section Updated Again! Several more new images and bits of information have �been added to�Magic Merbabies, thanks to Georgia again! This section, although still needing a few doll images, has now been organised to show all the different sets of dolls produced. Names and images added for all six Original Merbabies (four images are new), plus details of their accessories and Mer-pets. UK names and four out of six images added for the Floral Merbabies (three images are new), plus details of their accessories and Mer-pets. UK names added for the Teeny Merbabies, along with new information about the twin releases and their Mer-pets. One doll image re-organised into the correct section and one new image added of twins. Name of Magical Seahorse doll confirmed as �Iris�. Magic Merbabies :: Toy Section Updated! Several new images and bits of information have now been added to Magic Merbabies, thanks to Georgia! Packaging image and information of the six Floral Merbabies added. Hair Fun Vanity Case named and new packaging image added. Packaging image of Princess Bride Lille added. Packaging image of the four Teeny Merbabies added. Queen Of The Seas doll image and information added. Unknown (loose) dolls moved to bottom of page and images re-ordered. New information about Magic Water Palace added. It has now been confirmed that the European version came with its own doll, whereas the UK version did not. Name of Magical Seahorse playset now added along with one new image, confirming that it was a playset in it�s own right and not part of the Magic Water Palace playset. It also came with its own doll. A new page has been added for Fluffy Surprise! Fluffy Surprise was produced by Vivid Imaginations in 1998. They were a short lived series of cats, dogs and bears with feather boa type trims and a furry belly with a baby inside. Each character came holding a hoop (through a hole in one of their paws, with a split in the middle to remove it) and came with one small baby. There was a large plush dog (doubled as a rucksack) which came three babies of her own (slightly smaller than the hooped toys). I know very little about this series (other than what I have manages to work out from the images! ), so if you know any more or have any more images I can add please�contact me! Sweet Scents, Blooming Babies and Unknown TNT Dolls :: Toy Section Updated! Two new images have been added to the Sweet Scents page. Two new pages have now been added for Sweet Treats, produced by Matchbox in 1989. Three new pages have now been added for�Magic Merbabies, produced by Hasbro in 2002-04. Several pages have now been added for�Bouncin� Babies, and the sub lines Bouncin� Kids, Bouncin� Princess, Bouncin� Poniesand Big Sister �n Baby. They were produced by Galoob in 1989-90. Several pages have now been added for�Sonny Angel, �produced by Dreams Inc. from 2007 onwards. Several pages have now been added for�Starcastle, produced by Trendmasters from 1995 until the early 2000�s. There are still a few unidentified playsets, so if you have anymore information or images please�contact me! Little Pretties :: Toy Section Updated! The name of the unknown Picture Frame Pet has now been discovered (Happy Heather), and I have also added in information and images of the unproduced Fillies line. Several pages have now been�added for Flower�Fairies. Mystic�Babies�were produced by Mega in 2008-9. They were a series of colourful plastic baby dragons with brushable hair. The original sets came in eggs which transformed into little playsets. Get Along Gang :: Toy Section Updated! Magic Bottle Pets :: Toy Section Updated! A new pet has been added to�the Magic�Bottle Pets section, making four. Tea For Two :: Toy Section Updated! A new MIB image (back) has been added to�the Tea For Twosection, plus the names of all four dolls (Taffy�Apple, Pink Peppermint, Ginger Snap and Sweet Grape). New sections have been added for the My�Little Pony spin off lines Dream�Beauties, Li�l�Litters and�Petite�Ponies. The Dream Beauties section is still in need of many images, so please contact me if you can help. Several pages have now been added for Fabulous�Hair Friends. A page has now been added for Pretty�Little Pups. Image of one more Strap-On (tee, hee! )�added to Liddle�Kiddles. Hugga Bunch :: Toy Section Updated! Several new images added to Hugga�Bunch. Images added of four of the eight pairs of plastic dolls. Several new images added to Flip��n Fancy. Images of Trendy Wendy (both sides) and Fun Friends�pair (both sides) added. Information about two more playsets also added (no image�found yet). Names added in for all the unknown dolls pictured. Several new images added to Darlin��Dinos. Image of Lil� Dinos packaging. Bitsy Bears :: Toy Section Updated! One new image added to Bitsy�Bears. Image of second set of Wild Bunch Biking Pals. Several new pages have now been added for�Grumples�/ Razzcals (as requested)! A new page has been added for Glo�Pals. Several new pages have now been added for�Twinkle�Bears. Image of the large elephant added. Several new pages have now been added for�The�Light Up World of Everglo. Several new pages have now been added for�JellyBeandolls. Several new pages have now been added for�Li�l�Lolliypops dolls (aka Sweetie Pops & Daisy Dolls). Several new pages have now been added for�various TNT (Toys �n Things) scented dolls, including Blooming�Babies and Sweet�Scents. There is also a section for some Unknown�TNT Scented Dolls made in a very similar style�to the Blooming Babies and Sweet Scents dolls. 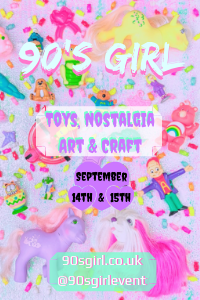 If you know�what series they�re from, or have any more images or information�on any of these dolls, please contact me! Several new pages have now been added for�Frou�Frou. Several new pages have now been added for�Crimp�n� Curl Pets & Crimp�n� Curl Pony. Several new pages have now been added for�Magic�Meadow Ponies. Thanks to Jana for all her images so I could make this section! Ghost Of The Doll�s Toy ID Forum now open for business! Since starting Ghost Of The Doll back in 2006 my Toy ID Help page has become more and more popular, with a great group of people who help me ID the toys. I decided that it was high time I set up a proper forum, to offers collectors the opportunity to ID their own and other toys without having to wait for me to slowly reply! I have taken the time to add in all the currently unidentified toys I still have, plus a few which have been but hadn�t got around to updating. Several new pages have now been added for�Always Sisters.�Thanks to Andrea who emailed me her booklet�scans so I could make this page! Several pictures have been updated in the�Bitsy Bearssection, plus two new discoveries! Thanks to Jana for all her images! Several new pages have now been added for�Little Beauties.�A big thanks to Jana and Eilonwe for all the images and information! A new page has been added for Puppy�Check-Up. If you know anything more about this�series, or have any images please contactme! Several new pages have now been added for�Sugar Planet. Several pages have now been added for Busy�Bears of Hippity Hollow.�Thanks to Emery who emailed me images of her collection�to enable me to create this page. I�ve also added the Brazilian�and Spanish counterparts � GulliverLandiaand Geyperland.